First stop, we’ll take you to a unique beach hut bakery for some must-try Peruvian cuisine at prices as cheap as $1! Some consider it to be Lima’s best spot to get breakfast! Next, we’ll stop at the most fascinating, historical spot yet – Tambo Colorado. 3 acres of Incan ruins located near the coast once a fortress and administrative site between the coast and the highlands! Note: Free with your Peru Hop wristband. Note:The Cultural Route is not more time on a bus. The free extra stops and tours on route are the reason for the later arrival time. Note:Note: The Express Route journey has no stops. It is four straight hours on a bus from Lima to Paracas. Ideal for those short on time. Nazca Flights Flight: If you want to do the Nazca Lines Flight, you can sign up for the private shuttle service that we help organize through our onboard guide. 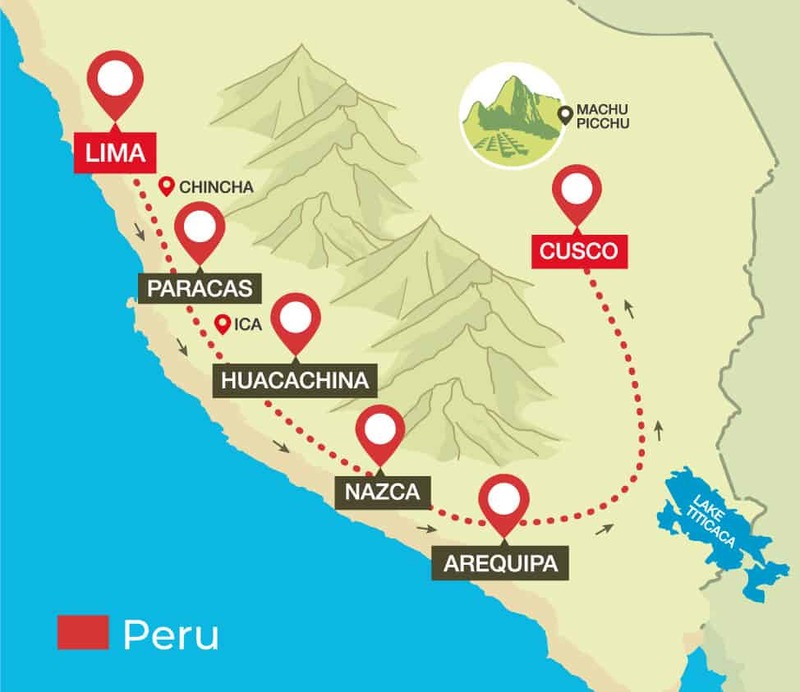 The shuttle departs Huacachina at 8:30am, you take the flight at 11am and then you can meet our Peru Hop bus at 7pm in Nazca. Ask your guide for more information about this. Cusco is our next stop after the beautiful white city of Arequipa. Only a few hours away, this enthralling city is famously known as the gateway to Machu Picchu. Full of culture and history, Cusco is a city not to be passed through quickly. The journey to Cusco from Arequipa is broken up by our stop at Marangani. At this non-touristy town you’ll get to enjoy an authentic Peruvian lunch and local prices. Departure From: Any hotel/hostel in central Arequipa.